Treat someone special to the gift of a full-course dinner for Lent featuring irresistibly meaty Mahi Mahi Fillets. 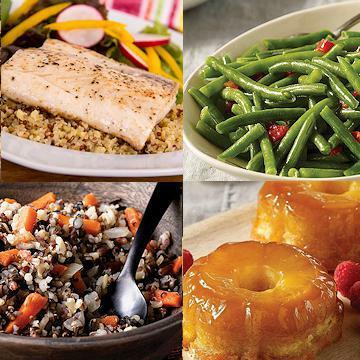 Enhanced with a side of heart-healthy 5 Grain Rice Pilaf and plump Green Beans, and finished with the traditional sweet/tart deliciousness of moist Pineapple Upside-Down Cakes, this meal will be a gift no family will want to forget. Now at a limited-time low price, you can send this gift today while enjoying incredible savings for yourself. Order today! Quick Thaw Method: Unpackage desired number of fish fillets and place in a sealable plastic bag. Remove as much air from the bag as possible and immerse in cold water for approximately 30 minutes. Broil or Grill: Broil or grill Mahi Mahi steaks approximately 5-7 minutes per side. Thicker portions may take slightly longer. They are done when the steaks are opaque throughout. Baste with butter when cooking, if desired. As with any fish, for a flaky, moist entree, avoid overcooking. Use a mixture of 1 Tbsp. of butter and 1 tsp. lemon juice to accompany your steaks. Microwave: Arrange two Mahi Mahi steaks in a baking dish. Brush steaks with butter and lemon juice. Cover with plastic wrap, venting one corner. Microwave for 3-4 minutes. Turn steaks over. Brush with butter; cover. Microwave 3-4 minutes or until fish is opaque throughout.